The following is the final mission report of Mars Desert Research Station Crew 165. 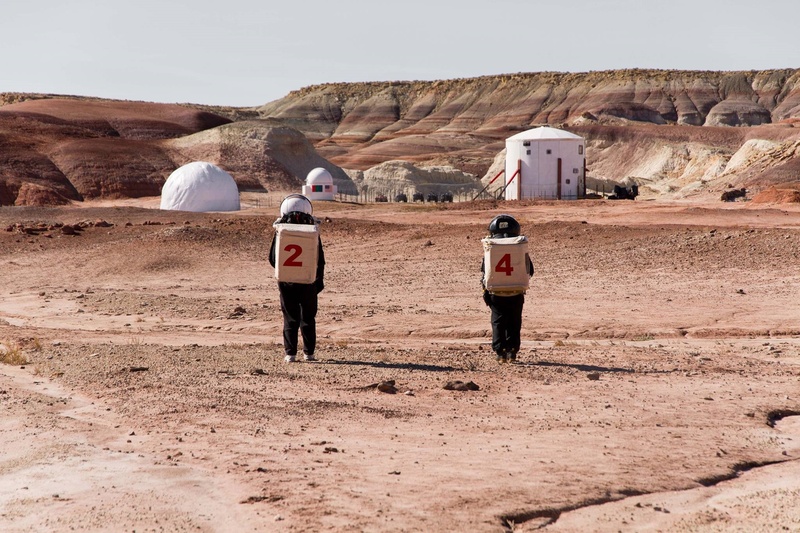 A full review of this year's activity at MDRS will be presented at the 19th Annual International Mars Society Convention, scheduled for September 22-25, 2016 at the Catholic University of America in Washington, D.C. The call for papers for the conference can be viewed at the Mars Society web site. The MDRS crew 165 is an international collaboration between North America Team Tharsis II and Team Nippon from Japan. 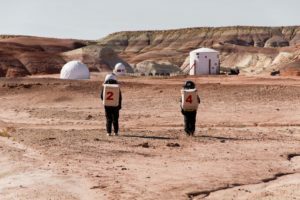 Pamela Nicoletatos and Ken Sullivan were returning MDRS members from Crew 149; Eriko Moriyama, Masashi Hiraki, Ryoko and Tomoya Mori were new to the MDRS facilities and SIM experience and were mentored by representatives from the Japanese chapter of The Mars Society. We had the intentions to conduct six main projects during our rotation however due to time restrictions, third parties and logistical constraints some of these had been put on hold for a future date. Our first project was to establish a Mars and SIM outreach program for students, granting insight to the opportunities and daily challenges within the SIM experience that are plausible factors when pursuing the prospect of interplanetary colonization. This however was a project we were unable to complete due to last minute equipment failure the day before our rotation began. We did in turn utilize our Crew Journalist and focus on social media outreach opportunities such as Facebook and Twitter to document the adventures of the crew. Feedback and responses to our experiences have been exceptional and extremely positive from around the world. The next project was a study dedicated to the analysis of realistic human activities and their impact on water, food and waste systems. The crew was closely monitored through daily water and food intake; water consumption for cooking and weight measurements for meal wastes, along with biological waste data that was collected through weight analyses. This data will be analyzed with a Japanese designed ECLSS (Environment Control and Life Support Systems) simulation software, to compare a human influenced environment cycling system with that of the pre-simulation data calculated with theoretical figures. The simulation results will be used to investigate whether or not the initial framework and calculations were close to the actual crew metabolism and be applied to the software algorithm to improve the accuracy of simulation. This project can contribute to the future manned space missions especially in closed-loop ECLSS such as a base on Mars. Our third project focused on the human footprint a crew/colony would have on an existing extraterrestrial environment, and which human associated microbes might be more prone to flourish in such harsh and extreme ecologies with a focus on both protein-utilizing and non-utilizing bacteria. Rover Data collections and samples of bacteria and protein present in the surrounding “Martian” terrain had to be modified due to the failure of the arrival of our rover unit to the MDRS facilities. This project was modified however to allow for the retrieval of soil samples by a member of the crew. Soil samples from 6 locations around the HAB, even in the designated septic containment area seemed to suffer little contamination by human derived bacteria, much to the Crew’s surprise. However it was discovered that there were a few natural bacteria with low-level detection in soil samples collected from these areas. On the contrary, soil collected from Sentinel Hill’s peak (A popular location both for MDRS crew members for EVA and tourists), showed high levels of both protein-utilizing and non-utilizing bacteria, however the bacteria present was not human-derived in nature. It was concluded that due to species of grasses and moss, which grows in Sentinel Hill’s summit, and while there were no plants in the other sample areas, Sentinel Hill’s peak has proven one of the best habitats for the presence of natural bacteria around the HAB be it of non-human origin. Overall it seemed to provide feedback that indeed Humans at the MDRS facilities had little to no impact on the ecology of the site. It would be interesting to analyze the soil component differences between Sentinel Hill’s summit and other areas. One additional factor to be taken into consideration would be climate conditions and how much influence they may have on the dispersion of foreign microbes within any given environment. • Encouraging innovation, along with creativity. Inspiring inventions, technological innovation and resourcefulness both in scholastic environments and to the general populous through a firsthand account of SIM Life and the Crew’s experience provided through social media. • Musk Observatory sessions. Alternate nights of viewing and photography. To provide both the collection and sharing of photographs from our astronomical observation to activate and energize an interest in Astronomy and exhibit images attained during our time in SIM. • HAL Reborn! Crew Commander and XO devised an updated and user-friendly HALpr guide for future crews. • Capcom guide revised: Supplied to Capcom and future crews. • Musk Observatory guide updates: Feedback supplied to MDRS Astronomy Support. • Benefits and positive affects both good food and presentations of foods have on the crew’s moral, bonding and social interactions, and were based solely on observed levels of engagement by all members of the crew. Meals were exceptional! For me personally, this rotation allowed for the opportunity to assume a Command Role. I had previous SIM experience as the GreenHab Officer and Crew Geologist at the MDRS facilities, however during my previous rotation I also took interest in the requirements to be a Commander of a crew. During my previous rotation I enjoyed being mentored in a Junior Engineering role and the responsibility for the full functionality of the EVA equipment for that Crew. This time I wanted to be able to challenge myself in a dynamic environment and successfully lead an international crew to project completions and a positive SIM experience. I strove to create a positive atmosphere in order for crew bonding and cultural exchange to occur and modeled my Command structure more on an “enabling and ownership” mentality compared to that of a less flexible military based format from my previous SIM experience. I personally feel that in order to get the best out of any crew member, a Commander must be able to see their strengths, facilitate opportunity for growth in areas that crew would like to develop and maintain an open environment to be approached to allow for flexibility and modification to command style. Enabling and Ownership provide crew with pride in their work as well as motivation throughout the term of their projects. It has been an honor to be a part of Crew 165 and an experience of a lifetime. Appreciation for their hard work and dedication cannot be described. Members of Crew 165, may our paths cross again!